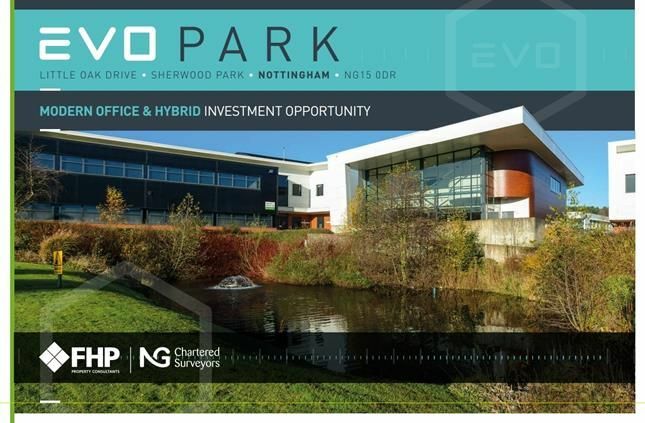 The property comprises 3 modern detached two storey office buildings located at Evo Park on Sherwood Business Park, The Piazza, Mercury House and Vertex and 5 'Pod' units providing offices and production/storage space. In total the buildings comprise some 110,163 sq ft with associated onsite car parking for 461 cars at a ratio of 1:238 sq ft. The Evo Pods provide office and hybrid options which have been recently remodelled to provide large glazed entrance reception areas and ground floor loading access. The property is held on a long leasehold interest on a 999 year lease granted on 25th December 1995 at a peppercorn. The buildings sit within well maintained attractive grounds with ponds, water features and breakout areas.